I’m very proud that Media Culpa has been included in HubSpot Hot 100 Marketing Blogs, a list of top blogs about online marketing. 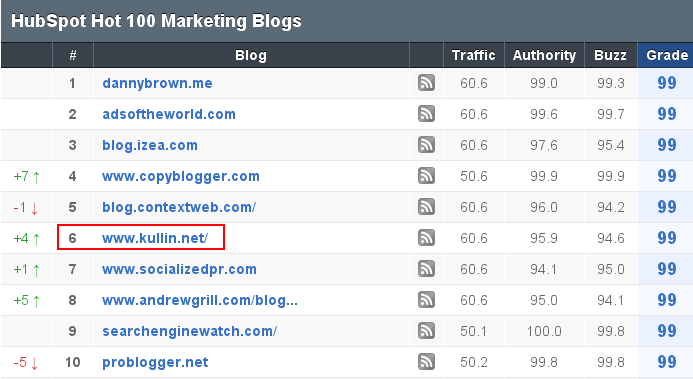 My blog is currently ranked surprisingly high, at #6, which is extremely flattering considering all the industry luminaries that are included. The ranking is performed by the Blog Grader tool and the report card for my blog can be found here. I’m a Marketing student and currently doing a little project on blogging. Just wanted to see what your take was on Blogging as a marketing tool and in what ways you have benefited from it? I wouldn’t mind getting other people’s comments on it either (please?) ” ) Thanks! !